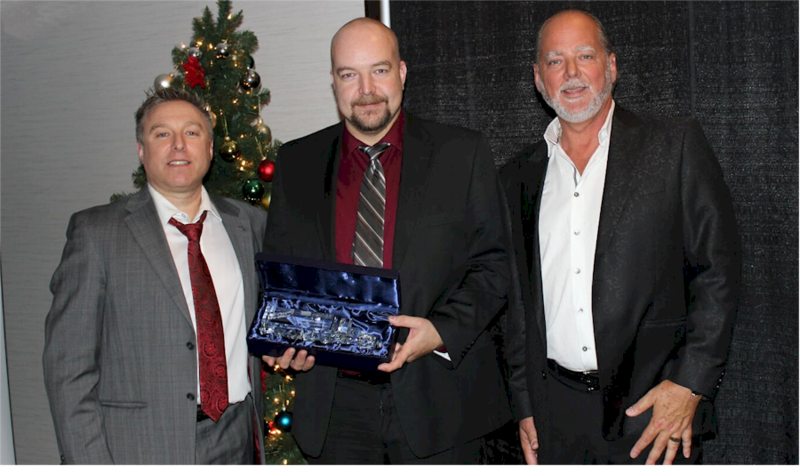 Payne Transportation Ltd Celebrates Service, Safety, and Honors Driver Of The Year at Annual Awards Gala - Payne Transportation Ltd.
L to R: Thomas McKee, Patrik Anias & Tom Payne Jr.
Staff and drivers at Payne Transportation came together on Friday November 23 to celebrate the accomplishments of another successful year in business and to recognize employees celebrating milestone anniversaries and drivers achievements in safe driving! The event was held at the Hilton Airport hotel in Winnipeg and was attended by over 140 of Payne’s drivers, mechanics, and office staff. Annually, the highlight of the gala, is the announcement of the “Payne Transportation Driver of the Year”. The selection process for the driver of the year involves being nominated by the operations team, vetted by the safety department to ensure they qualify, and then voted on by the Executive Advisory Committee. The finalists were announced and recognized at the awards gala. They were, Gordon Reimer, Christer Gustafsson , Patrik Anias, Byung Taek Park and Peter Wiebe. Out of this group of finalists Patrik Anias was selected as the 2018 Payne Transportation Driver Of The Year. Patrik has been an owner operator with Payne since August 2015 and was chosen because of his dedication to hard work, his support of his fellow drivers and the fact that he will do whatever is asked of him. He has even rescued other drivers when they need help! Once when another driver had major tractor issues on the east coast, and when asked if he’d run team after he delivered and finish delivering the driver who broke down…his response was “no problem”. Patrik is always willing to help out his fellow drivers, he also bailed out another driver one time and delivered a 12 drop California load all in one week and all while ensuring he maintained compliance with his e-logs.